Shukri already knows all about school pride in the U.S. from her time in Massachusetts. 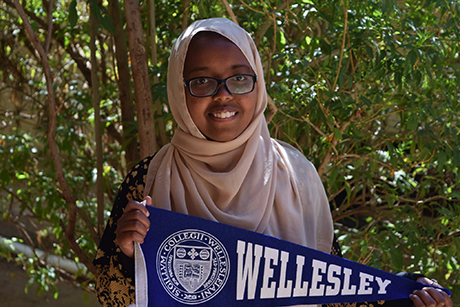 Congratulations to Shukri Ahmed Ali for her acceptance to Wellesley College! She spent four years at Abaarso School of Science and Technology, one year in Massachusetts through PAX, applied while working back in Somalia, and now will attend one of the top liberal arts colleges in the U.S. She will also be joining a cohort of next-generation leaders who will contribute to social and economic progress as a MasterCard Foundation Scholar.